Four hundred years after Caravaggio’s death, the artist’s work and restless life continues to capture the eye and the imagination. Countless tourists and art history students flock to see his paintings, but his work also draws less savoury characters: art thieves and forgers. Fr Marius Zerafa, a Maltese Dominican and former museum director, has had his own brush with Caravaggio thieves, after they stole a painting of St Jerome from the co-Cathedral of St John in Valletta on New Year’s Eve 1984. While many stolen paintings disappear forever, Fr Marius was able to mastermind this painting’s recovery. For two years after the heist, nothing more was heard about the picture. It had simply vanished. Then one day Fr Marius was approached by a young man who handed him a tape and a Polaroid picture of the painting of St Jerome. Over the next eight months he would work ceaselessly towards retrieving the lost painting. At the time Fr Marius was director of the Museums in Malta and had set up the National Museum of Fine Arts in Valletta. Today, the Dominican art historian lectures about sacred art at the Angelicum in Rome, hears Confessions at Santa Maria Maggiore during his holidays, paints, sculpts, does some restoration work and continues to be the chairman of the Archdiocese of Malta’s Commission for Sacred Art. He is full of life and curiosity. His snow-white hair stands on end in marked contrast to his tan, the mischievous twinkle in his eyes is barely hidden by the bottle-thick 1970s-style glasses he sports. Fr Marius is a born storyteller; he has lived through a lot and seen a great deal. At 15, he joined the Dominican order. After three years in Malta, he moved to the now-closed Hawkesyard Priory in Staffordshire and then to Blackfriars, Oxford, between 1948 and 1952. The post-war, pre-Conciliar years in religious life were austere, but Fr Marius remembers his time there with great fondness. He obtained his STL and a Doctorate in Social Sciences at the Angelicum and studied art history at the University of London. He subsequently taught, studied, lectured and wrote with tireless energy. He became assistant curator of Fine Arts in the Museums Department of Malta in 1970 and then curator in 1975 and director of Museums in 1981. Like many art historians, Fr Marius is attached to his digital camera – or, rather, it is attached to him with a belt so he does not miss an opportunity to snap away. At 80, he is incredibly plugged in and constantly fires off emails and digital photographs. It is easy to imagine the energy he must have put into getting the painting back, against the odds, and employing creative thinking to find the Caravaggio again. Back in 1986, after the first note was delivered, Fr Marius was worried because he thought the gang might be in cahoots with the police, so he took the injunction not to report the theft seriously. He says he struggled to raise interest in the case either among the country’s ministers or the monsigniori in the local curia. He started getting daily phone calls about St Jerome. Then, in the art thief’s equivalent of chopping off a hostage’s fingers, the gang started sending Fr Marius little pieces of the precious painting. In his efforts to keep the band of thieves talking to him and give them the impression that he was interested in buying the painting back he started negotiating down the price to a quarter-of-a-million Maltese lire. If they had come to him, he would have been bound by the seal of the confessional, he says, and would have had difficulty retrieving the painting from them. After eight months Fr Marius, with the help of a technologically minded young man, managed to trace the calls to a small shoe factory on the island where the thieves were operating. He got hold of their work books and finally passed the information on to the police. It was his first contact with the authorities. A week later he chose August 4, the traditional day on which the Feast of St Dominic is celebrated in Malta, to be the day on which the painting would be retrieved. The police arrived with helicopters and cars at the arranged meeting place and they retrieved the Caravaggio and arrested the gang members. It emerged that the gang had paid £5,000 to have Fr Marius kidnapped during the exchange. The members of the Caravaggio gang were never brought to justice. They started a constitutional case against the police because of illegal phone tapping. Of the two men accused, one had possibly been given an overdose and died, while the other died as the case dragged on in court. The painting was quite damaged as a result of the heist, but was spoiled even more while it was stored by the police. The painting suffered because it had been cut from the stretcher and was rolled up. 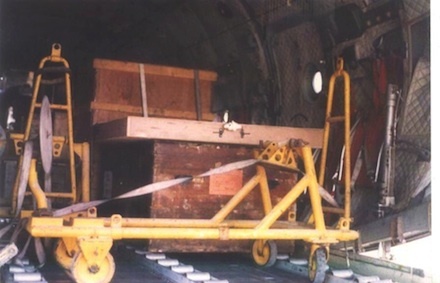 Fr Marius travelled to Rome in an old military plane without seats to have the painting restored there. He says that it is now in a perfect condition. In 1989, another burglary attempt at the Co-Cathedral of St John left Caravaggio’s magnum opus, The Beheading of St John badly damaged. The thieves had entered the cathedral to steal silver from an old icon, the Madonna of Caraffa and parts of the gates. The thieves jumped over the barrier, slashing the Beheading, the only painting which bears Caravaggio’s signature. Fr Marius took the painting to Livorno on an Italian cruiser called the Cassiopeia. The painting was restored in Florence in 1997 and exhibited in the Church of the Carmine for a month. It returned to Malta with Fr Marius on an Italian warship called the Vega. The Maltese are very proud of Caravaggio’s stay on the island. The disgraced painter fled from Rome to Naples and then to the Fortress Island after he killed a man in a street brawl. The Knights of St John, keen to have the famous artist on the island, granted him asylum on condition he paint for them. He became a brother of the order but soon picked a fight with one of the knights and fled from the island. He is believed to have died of fever on July 28 1610.
the theory, saying that the painting is not a Caravaggio. Fr Marius, who was speaking before the rebuttal, said it was too early to say whether the painting was a real Caravaggio. But regardless of whether the painting is genuine or fake, Fr Marius says he will definitely go to see the painting when he’s back in Rome later this summer.